If dietary components and drugs consumed by flies could affect the insects’ cell reproduction, could it do the same to human cancer patients? More than 180 high school students in the Immersion Science Program (ISP) at Fox Chase Cancer Center attempted to answer this question after conducting a six-week science experiment to contribute to real-world cancer research. “In the past, students didn’t have as much of a hands-on approach. This year, the students totally got involved in the experiment process, and learned scientific methodology, which is so important,” said Paula Miller, a teacher at Abraham Lincoln High School in Philadelphia. 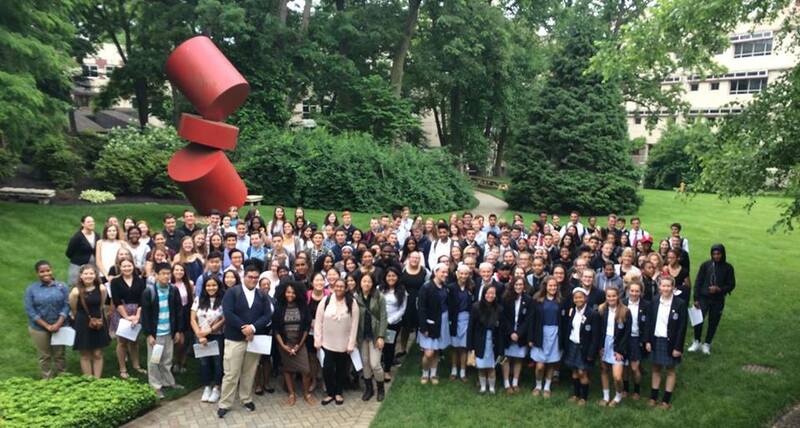 On June 5 the students, representing five Philadelphia-area high schools, came together at Fox Chase for the second year of the ISP’s Citizen Science, a mini-symposium, where they presented their research and met with working scientists. The Classroom ISP is funded by the Society for Developmental Biology, providing an opportunity for students to contribute to cancer research and learn about careers in science. Before the symposium, the students spent six to eig​ht weeks testing whether certain compounds in common foods would interfere with the effectiveness of cancer drugs. With the guidance of five teachers who trained with the ISP, students from Nazareth Academy High School, Academy at Palumbo Philadelphia, Philadelphia Performing Arts Academy, Kingsway Regional High School, and Abraham Lincoln High School generated data that may play a key role in understanding cancer cell growth. Dara Ruiz-Whalen, educational director of the program, founded ISP as a way for teachers to immerse their students in a hands-on oncology research experience. During the symposium, students excitedly reported their discoveries to a panel of judges. “When we found that selenium and burdock slowed down rates of reproduction of the flies’ cells, we realized that this could be beneficial to humans, and slowing down the reproduction of cancer cells,” said Ashley Hermansen, a senior at Kingsway Regional High School. The five speakers at the symposium included Philadelphia entrepreneurs, PhD students, professors, and high school students who previously participated in the ISP. All shared insights about pursuing careers in the field of science. Alana O’Reilly, PhD, scientific director of the ISP, was excited about the students’ enthusiasm and dedication to the experiment.